The Winchesters and the Angel Castiel meet back up with an old friend: demon Meg. The demon Crowley is now the king of hell, since Sam and Dean trapped Lucifer back in the pit, and he’s on a mission to track down a way to claim Purgatory next. Monsters, it seems, come from Purgatory and go there when they die, so he thinks that by collecting the creators of different monsters – the Alphas of their respective races – he’ll be able to figure out how to take over Purgatory. Toward that end, he’s resurrected Sam, but without his soul, and is blackmailing Sam and Dean into working for him to get it back. One of the monsters they’ve already caught is the Alpha Shifter, who Crowley is interrogating. The casting director got a bit of a break this week, because the shifter has taken the form of Crowley, so he’s torturing himself. It ends with Crowley decapitating the Alpha, which really doesn’t particularly seem to help his case, but then, Crowley is a demon, so you can forgive him for being driven by his passions. The Winchesters need an ace in the hole, which in this case comes from the angel Castiel, who Sam summons by tricking him into thinking the plot of Raiders of the Lost Ark is being enacted and they’ve found the ark of the covenant. Castiel attempts to chastise Sam for drawing him away from his battle on a false alarm, but Sam points out that if Castiel doesn’t help him, he really has nothing better to do than think of ways to kill him. After all, Sam doesn’t need to sleep. They convince him, however, that sacrificing his grandchildren for his daughter might not be the best plan. Making deals with demons to bring loved ones back from the dead is their Achilles heel, and one that seems to run in the family. Samuel gives them a lead on where Crowley may be hanging out … but it turns out that this is a set-up. 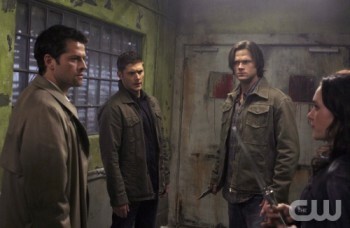 While raiding the place, Samuel banishes Castiel and then Sam, Dean, and Meg are captured by Crowley. Samuel tries to make a case for his betrayal, since he doesn’t even know what Sam is and Dean is basically a stranger to him, so of course he would choose his daughter over them. This argument doesn’t set well with Dean, who swears that when he gets out of this if he ever sees Samuel again, it’ll be to kill him. Sam begins to gnaw on his own arm. What, does he have demon blood hidden in there or something? No, turns out that he’s using his blood to draw a devil’s snare on the ceiling (a pentagram-looking symbol which traps demons). When the demons come to take him out of his cell, they’re trapped and he’s able to escape … just in time to rescue Dean from becoming lunch for a couple of monsters, then they bust Meg out of the chair where she was strapped down with Colin Nemec torturing her. Sam believes him, so lets Meg into the snare to kill Crowley. Instead, Crowley kicks her legs out from under her, grabs the demon-slaying knife, and throws it into the ceiling, rupturing the ceiling’s material enough to break the snare. He busts out, throwing Sam and Dean around telekinetically, but then Castiel shows back up, this time with a bag full of bones … Crowley’s bones. Looks like he didn’t hide them well enough. Castiel again asks whether Crowley can get Sam’s soul out. No, he can’t … so Castiel torches the bones, destroying Crowley. Meg escapes, but the boys get the demon-killing knife back, at least. Worst of all, Sam seems to have decided that getting his soul back isn’t really all it’s cracked up to be. “You know what, when angels and demons agree on something, call me nuts, I pay attention.” The episode ends with Sam walking away from Dean. So, where are things now? Dean wants to kill Samuel if he ever sees him again. Sam’s decided he doesn’t really care to get his soul back. If he does end up getting it back, it may kill him … if he’s lucky. Castiel’s war against Raphael for control of Heaven is not going well. There’s no one in charge of Hell at the moment, although I have a guess that Meg will be angling for the job. And on the upcoming episode this Friday … Death takes a holiday, handing the job over to none other than Dean Winchester. From the look of things, Sam may also go on a murderous rampage.